Is your work platform OSHA compliant? 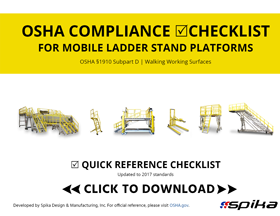 Download this easy-to-use checklist to ensure your work platforms and ladder stands protect you from safety citations and, most importantly, protect your users from injury. Fall protection and scaffolding standards have been the most frequently cited OSHA violation for years. In addition to hefty fines, violations put a company at risk for higher workers' comp rates, decreased employee morale, lost work days, and severe employee injuries, including death. Protect yourself by evaluating your work platforms today.